Last week’s Wetland Wednesday mentioned 3 main criteria as part of identifying a wetland (wetland hydrology, hydrophytic vegetation, and hydric soils). – Today we’ll look at how plants and soils help scientists delineate wetlands. In the field, scientists identify and sample soils and plants as part of wetland delineation. The LSU AgCenter groups plant species based on where the plant is naturally found as seen in the table below. Wetland plants have adapted to flooded soils. “Obligate” plants can tolerate water at high levels or when soil saturation is a normal condition to that area. Examples of these plants include the bald cypress (Taxodium distichum), or cattail (Typha latifolia) . In contrast, plants that cannot handle flooded conditions for an extended period would naturally be in the “upland” area of land (i.e. winged sumac (Rhus copallina), eastern redbud (Cercis canadensis), or panic grass (Dichanthelium sp.) . People delineating wetlands focus on a project area according to aerial and soil maps along with aerial photographs . Delineators then take soil samples and determine characteristics seen in hydric soils which relate to cycles of flooding and drying. – Examples of those include oxidized soils, hydrogen sulfide (rotten egg smell) and organic bodies found on plant roots. Finally, the plant and soil types are compared, tested, then matched to determine wetland boundaries for mapping and policy purposes . Wetland delineation is a tool for protecting and documenting these important landscapes which contribute to a healthy and functional environment. It is important to note that wetland delineation requires much more than just plant and soil identification. CWPPRA utilizes sound science, engineering, mapping, and geo-technical surveys in the process of planning, approving, constructing, and maintaining coastal Louisiana wetland restoration projects. To provide the best possible care, doctors first must know what is going on with their patients. The same goes for ecologists and engineers with wetlands. Just like doctors can measure your growth and deduce what could help you get over a sickness, ecologists measure the “health” of ecosystems to try to keep them healthy. Wetland habitats have many moving parts which makes them difficult to fully understand, but we can get a pretty good idea of whether they are growing or deteriorating and sometimes why. All CWPPRA projects require significant amounts of research to estimate the benefit of the project and minimize any damage that could come from disturbing already established wetlands. CWPPRA funds the Coastwide Reference Monitoring System (CRMS) program, which provides reliable coastal elevation data to scientists. Completed projects are monitored for wetland health factors including land accretion, productivity, and water quality to determine whether they are making a positive impact on coastal systems. Elevation studies are necessary across our coast since we experience such high levels of sediment subsidence. Elevation can be measured in a variety of ways, such as geodetic leveling, Interferometric Synthetic Aperture Radar (inSAR), or satellite imaging. Because of the lower precision, satellite imaging is not great for measuring elevation change for a specific point but is relatively reliable for larger changes over longer periods of time. Another common technique for measuring elevation change in wetland ecology is Rod Surface Elevation Tables with Marker Horizons (RSET-MH), which is implemented at all CRMS sites. An RSET is attached to a deep benchmark that will resist erosion and accretion, somewhere between 20 and 25 meters below the surface of the marsh, where the hard-packed sediments lie. With a benchmark, scientists can measure the relative surface elevation . To measure the rate of sediment accretion between two time periods researchers deposit a layer of white clay on the soil’s surface, called a marker horizon. At a later date, researchers return to the site, collect a core sample, and measure the amount of sediment above the white clay to calculate an accretion rate. RSET-MH is great for measuring one specific site for small and precise elevation changes, but is limited in area coverage. Luckily, through the Coastwide Reference Monitoring System, we are able to monitor elevation change and accretion rates at over 390 sites across the coast! Measuring wetland health has many factors, not only elevation change. Check in next week for our next installment on wetland monitoring! The Coastal Wetlands Planning, Protection and Restoration Act (CWPPRA) is federal legislation enacted in 1990 to identify, prepare, and fund construction of coastal wetland restoration projects in Louisiana. As part of the CWPPRA program, there is also the CWPPRA public outreach committee. The CWPPRA outreach committee works with people of different ages, backgrounds, and interests from across the state and country. 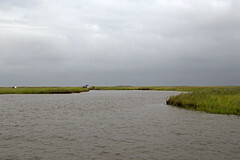 The committee works to develop an appreciation for the unique wetlands of Louisiana, and the role that CWPPRA has in protecting and restoring those resources. Although based in Lafayette, Louisiana at the USGS Wetland and Aquatic Research, outreach staff travel across Louisiana and beyond to talk with policy-makers, educators, fishermen and hunters, scientists, and community members. maintaining the LUCC calendar for coastal events. The CWPPRA Public Outreach Committee enjoys talking to people about our interest in coastal Louisiana, and these conversations aid in the progress of coastal wetland restoration. Given the complex nature and scale of land loss in Louisiana, it takes many people working together to help restore the coast. — CWPPRA Outreach educates the public about why coastal wetland restoration is important and how CWPPRA projects contribute to supporting these habitats and communities. More information about the outreach materials available can be found at lacoast.gov.